A recent complaint made by others about the Marvel Cinematic Universe is how each new film introducing a certain character and their world follows a very standard formula that’s easy to identify; set up the main character and their powers and responsibilities, have them go on a personal quest to become the hero they’re meant to be, and eventually fight the villain at the end who’s usually some suit-wearing business type or someone with a costume and abilities that match the hero’s own. Although this formula has certainly proven time and time again to be successful, at least in the MCU, the complaints that not enough variety is being given to the structure are entirely understandable, and even I can admit that at times I wish there would be a new superhero film that would do something far beyond what’s expected. Well, that wish has now come true; Black Panther not only does things its own way, even though elements of the formula are still there, but it does it in such a vibrant and exciting way that it immediately ranks up there among the very best that the MCU has yet to offer. After being introduced in Captain America: Civil War, T’Challa (Chadwick Boseman) returns home to the secluded and technologically-advanced African nation of Wakanda, where he is due to be sworn in as its new King. However, a threat to his rule soon emerges in the form of a young Wakandan exile known as Killmonger (Michael B. Jordan, who must be thrilled to be in a good Marvel movie after appearing in Fant4stic), and T’Challa is forced on a mission that sees him adopting the Black Panther mantle for the fight for his and his country’s future. In terms of plot, I really don’t want to say much more because it’s the kind of story that works best if you go in as blind as possible. It’s definitely a Marvel movie, and you can tell by some of the recognisable elements that are scattered here and there, but more importantly it stands firmly on its own as not just a great superhero movie, but also a damn good film in its own right. Ryan Coogler, who is astonishingly now three-for-three in his filmmaking career following Fruitvale Station and Creed, is a fantastic director who knows exactly the right tone to strike in each and every scene, and now that he’s been given the budget of, well, a Marvel movie to work with, he’s also allowed to flex his level of imagination and visual creativity to whole new dimensions. The world of Wakanda is incredible to witness, not just due to its technological advancements thanks to its unlimited supply of fictional metal vibranium – which is established as the metal used to create Captain America’s iconic shield – but also because of its firm roots in traditional African culture, which are lovingly all over this environment from the costumes to the score which incorporates music from all types of African nations. With how great this film looks, Coogler has made a vast and big-budgeted celebration of Africa itself, on top of a superhero blockbuster which further progresses how wonderfully it treats its roots. T’Challa is one of the MCU’s brightest and most well-rounded new heroes to its ever-expanding roster, and Boseman plays him with such grace and hostility that it’s easy to see why this man is poised to become King. Meanwhile, in what seems to be a direct countermove against the regular MCU criticism that the villains are often underwhelming in comparison to the hero, Jordan makes his Killmonger an emotionally resonant human being with very understandable reasons why he’s doing the things he does in this movie, as evil as they may be, which through a mixture of great acting as well as solid writing makes him perhaps the most compelling MCU bad guy since Loki first popped up. This is more of an ensemble film than you may be led to believe, with well-defined characters and really strong performances all across the board, including veteran character actors like Forest Whitaker and Angela Bassett, to newer standouts like Lupita Nyong’o and Daniel Kaluuya. 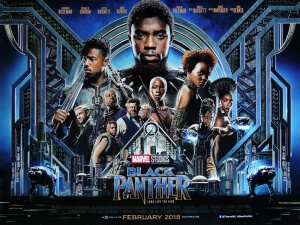 Standouts in this expansive supporting cast include Danai Gurira as the head of the Wakandan special forces who gets more than one golden opportunity to be an awesome badass, and Letitia Wright who is perhaps the most adorable Quartermaster since Ben Whishaw took over as Q in the Bond movies. Above it being just a great Marvel movie, certainly up there with the very best, this is a wonderfully made and written film that has you understanding each and every character’s intention without forcing it down your throat, and respects its audience enough to give them emotionally powerful moments on top of its many spectacular action sequences without once giving them an easy way out. The filmmaking alone is a thing of sheer beauty, and Coogler should be set for life now that he’s proven to be a brilliant director no matter what the budget, but this is a Marvel movie unlike any other and definitely deserves its place at the higher end of the MCU’s many achievements thus far. Black Panther introduces the breathtaking world of Wakanda within the Marvel Cinematic Universe in spectacular fashion, but beyond it being one of the greater MCU movies it’s also a great standalone film, with excellent directing, writing, acting and production values making it a very special and especially unmissable entry into Marvel’s ever-expanding roster.